BREAKING BAD - Just watched the premier of the first episode of the final season and geez. I can't really describe how I feel other than stating that this is my favorite show of all time. To me the most significant stories are those of ordinary people in extraordinary situations, albeit fictional. Mud - Ellis, Neckbone, Mud, Juniper. These are the names of the characters in this film set in Arkansas along the Mississippi River. Modern day Adventures of Huck Finn kind of story. Just a really great film. The Dust Bowl - A PBS two part documentary about the dust storms in the Great Plains during the 1930s. Still need to watch part 2 but I loved part 1. The interviews with the families who endured and survived the natural disaster are so touching. I find just the manner in which they speak, using idioms and phrases long forgotten, so interesting. 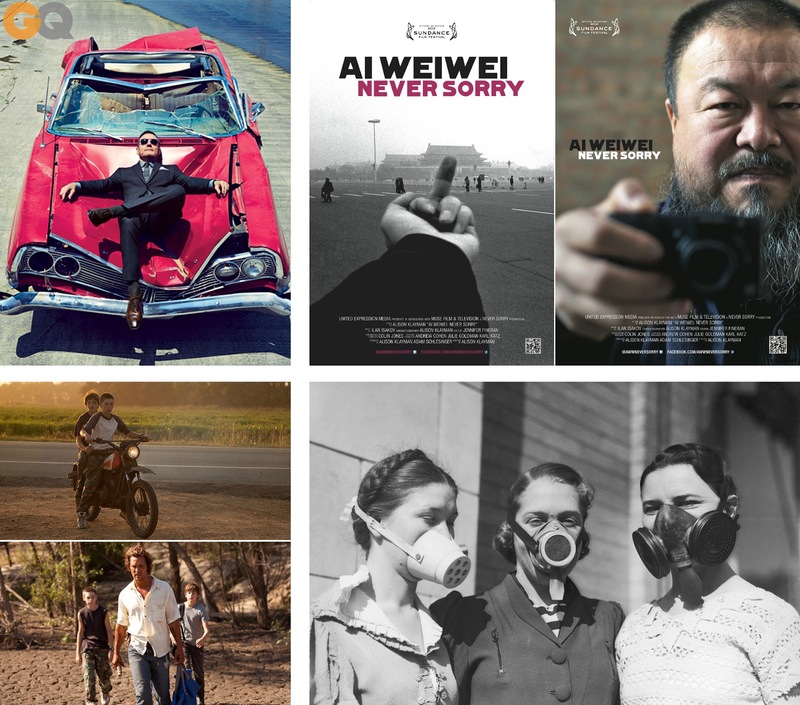 Ai Weiwei: Never Sorry - I've been following the work of artist Ai Weiwei for a while now but never really researched into his past. This documentary delves into his history and follows the pivotal moments of his career as an artist and activist. Very insightful and educational for anyone interested in art, movements, humanitarianism, communism, the power of one and the power of the internet. In the past two months, I've picked up my pace of reading a little. Unfortunately, my book selection is at the mercy of the Los Angeles Public Library's ebook collection and availability. Here's what I've been reading on my daily commute, free time, and sometimes past midnight on weeknights (gasp). The Paris Wife by Paula McLain tells the story of Ernest Hemingway's first wife during their courtship and marriage. On the whole, it's a frustrating and depressing story, because it's pretty common knowledge that Ernest Hemingway had many wives, committed suicide, and his one true love was a nurse played by Sandra Bullock (in In Love and War). I kept thinking that she was so dumb for staying with him for so long. I think the book is very well written, with some of the passages having a dreamy quality. I found myself agreeing with the narrator's realizations and thoughts on love and marriage. I definitely recommend the book but be forewarned that you'll probably feel sad and suspicious of all men for a couple days after reading it. I stepped away from the comfort of my laptop to borrow the physical book for Bringing up Bebe by Pamela Druckerman. I've had this book on my to-read list for a while, and I finally felt motivated to read it after being surrounded by lots of parents and child development experts at work. I haven't finished the book, but a lot of the ideas are really interesting - interesting enough to study more and perhaps implement with my future family. If anything, the anecdotes are fun to read and the author has made me laugh out loud more than a few times. The Newlyweds by Nell Freudenberger is a book I picked up because of the title and cover. I was intrigued by the story at first because it tells the story of a Bangladeshi woman who marries an American man she meets over the internet. In order to not give the book away, I will just say that I didn't really get to know the husband character - maybe the author wrote it that way on purpose - and I didn't like him much. The book is worth it to me to learn more about life in Bangladesh, but the story took a strange twist at the end that was simultaneously weird and predictable. The 19th Wife by David Ebershoff is a book that I could not put down. The Kindle distorts your sense of the length of the book, but I felt that this book was neverending... in a good way! I have never had Mormon friends, so it was fascinating to learn about the early days of Mormonism (and polygamy). The historical story is intertwined with a modern-day murder mystery, which kept me glued to the book. I was fully satisfied when I finally finished the book, and I feel at least a little more aware of Mormonism. The Language of Flowers by Vanessa Diffenbaugh was another interesting read. I liked the story because I was able to learn about the current foster care system - which leans more toward Law and Order SVU than Anne of Green Gables. The main character's distrust of all people and emotions becomes tiresome after a while, and I think the story and characters could have been more fully developed. It seems like one of those books that was written and sold off to the publisher pretty quickly. Any book recommendations? Please share! Monica, I also started Breaking Bad this summer, I am almost caught up, and it is CRAZY!!! Boyoung hurry up!!! only 6 episodes left and i'm about to have a heart attack! I totally caught up ,and this past week's episode was INSANE!! thanks for the book recs! !